This is a 5 Kroner coin depicting Queen Margrethe II of Denmark. Under her portrait is a heart which is the mint mark for Copenhagen, on the reverse is the royal crest. 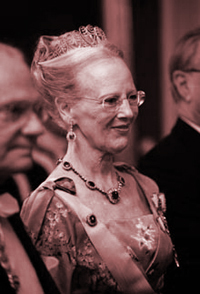 Queen Margrethe II is the 49th Danish monarch in a direct line of succession from King Harald Bluetooth, who united Denmark more than a thousand years ago. Margrethe is the eldest daughter of King Frederik IX and Queen Consort Ingrid of Sweden. Frederik and Ingrid had three daughters and no sons. According to Denmark's succession law (the Royal Ordinance of 1853), the throne could only be passed to a male thus the kings younger brother, Prince Knud, was heir presumptive. Unfortunately for Prince Knud, in 1953, an Act of Succession was passed which changed Denmark's secession from Sallic (or Agnatic) succession to Cognatic primogeniture (or male-preference primogeniture). This allows a female to succeed if she has no living brothers and no deceased brothers who left surviving legitimate descendents. This push for a change in the succession law may have been due to the popularity of Frederik and his Daughters, or simply a change in accepted norms and the role of women in Danish society. She was confirmed as Heiress Presumptive in 1955 at the age of 15, at the age of 18 she was given a seat in the Council of State. The young Princess attended various colleges between 1960 and 1965. In 1967 she married the French Diplomat Henri de Laborde de Monpezat whom she had met in Britain. Upon his marriage to Margrethe, Monpezat became 'Prince Henrik of Denmark'. They had two children: Frederik André Henrik Christian, Crown Prince of Denmark born in 1968 and Joachim Holger Waldemar Christian, Prince of Denmark born the following year. Shortly after delivering his New Year's Address to the Nation, King Frederik IX fell ill and passed away on January 14, 1972. 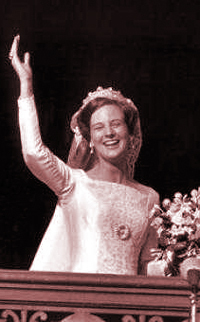 At the age of 32, Margrethe became the first female Danish Sovereign upon her accession to the throne. Although the queen signs all acts of legislation before they can become law and she formally appoints each new government among other formal powers, her position is mainly as a figurehead and her duties are largely diplomatic in nature. As the official head of state the queen hosts official visits by foreign heads of state and pays state visits abroad. She has national symbolic significance, but plays no real active role in the government of the country and takes no political sides. She expresses many of her opinions through her new years speeches which are highly anticipated events for many in Danish society. In recent years the Queen has called upon the Danish people to show more tolerance toward new citizens from foreign countries. She has also talked about environmental problems; world peace; violence in society; Danish identity, responsibility, freedom, pessimism, nationalism; the strength of Danish cultural roots; human rights; self-righteousness; the lack-of self-confidence of many citizens; and the possibilities of a small country in the larger world. Known as 'Daisy' to family and friends it is said she has a highly sophisticated sense of humor she is said to be a great lover of splendor and strong colors, of precious gems and sumptuous gowns; she revels in a good dance, a challenging game of bridge, delicious food and interesting people. Her motto is: "God's help, the people's love, Denmark's strength." 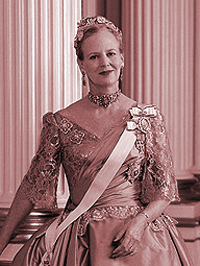 Queen Margrethe speaks 5 languages and is also an accomplished artist and painter. In 1977 Tolkien's Lord of the Rings was published in Danish with illustrations by Ingahild Grathmer, a pseudonym the Queen used for her first works. In addition to her water color and oil paintings, she has designed bishops' copes for several cathedrals in Denmark, designed Christmas seals, as well as costumes and scenes for dramatic productions. Some of her illustrated books and calendars have been sold for charitable purposes. In 1988 the Queen began to exhibit her work under her own name. Her artistic creations have been shown in galleries all over Denmark and well as Sweden, Iceland, Germany and Norway.